NASHVILLE, TENNESSEE, UNITED STATES, April 2, 2019 /EINPresswire.com/ -- Hurry, hurry, hurry, wrestling fans! The SideShow is coming to town. Saturday, April 13th, the Victory Center in Morrison, TN will host an explosive mashup of wrestling when SideShow Wrestling comes to town to join Mayhem Wrestling & Tennessee All Pro Wrestling’s Super Showdown. 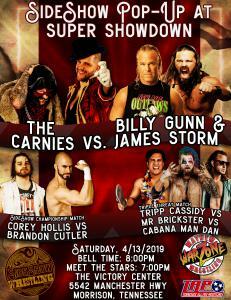 The SideShow Pop-Up promises to be a dynamic event showcasing wrestling wonders from around the globe, such as NXT and ROH veteran Corey Hollis squaring off in a test of strength and skill against All Elite Wrestling's own Brandon Cutler. And in the main event, two titans - three-time TNA Champion and Dojo Pro Veteran “Cowboy” James Storm, and WWE Hall of Famer Billy Gunn - team up to tame the ferocious freak show of fighting, Kerry Awful and Nick Iggy, better known as The Carnies.